The Brady Collection can be seen in everything from fast casual restaurants to chic offices. Brady’s design is simple and straightforward, making it the kind of product that can be easily placed in most commercial spaces. So, in honor of one of our most versatile collections, we rounded up five of our favorite Brady installations to date. Beachy, breezy, colorful. Tapestry is dual-concept restaurant located in downtown Boston. 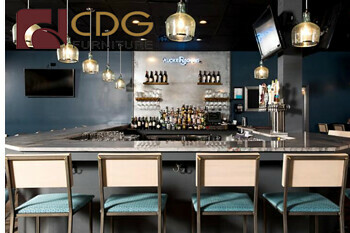 With the help of design firm Dyer Brown, the restaurant's design was inspired by the owners' travels. The space features exposed brick, sea-inspired decor, and a lovely yellow, white, and blue color scheme found on the booths and the sleek Brady Barstools. If you are looking for the Brady Chair or Barstool, you won’t find it. In fact, this rad office cafe at the Vans headquarters uses the Brady Pedestal Table. The Brady Table was specified using a circular Maple top—a shape rarely seen with this angular table base. The final design is spectacular. It balances wood accents, round shapes, and punchy graphics to achieve that signature Vans aesthetic. You’ll find the Brady Chair tucked alongside reclaimed wood tables in Brome Modern Eatery, Detroit’s buzziest fast casual restaurant. Brome is 6,000 square feet of burgers, juice, eclectic furniture, and amazing architectural features. While the Brady Chairs aren't center stage, this project perfectly captures the versatility and simplicity of this chair when its paired with both modern and traditional furniture. The interior gleams inside Rucker Johns with soothing cool colors and sophisticated textures. For added comfort and texture, the designers of Rucker Johns added an upholstered seat to the Brady Chairs and Barstools. The fabric was inspired by the seaweed found along the Green Isle, North Carolina beaches, and helps soften Brady’s industrial features. Last but not least, we have the bright blue Brady Chairs in Great State Burger. Great State is a Seattle-based burger chain known for it classic American fare and jovial mountain-inspired branding. Brady is often used in busy spaces like chain restaurants because of its durable steel frame and Maple seat and back. Throw in a custom metal finish like the one done here, and you have an on-brand, modern chair that will last for years. Looking for even more inspiration? 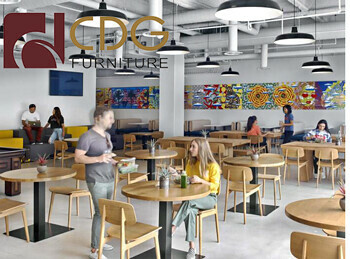 Welcome to view our website : www.cdgfurniture.com，metal furniture manufacturer-Cdgfurniture will tell more infomation to you.